My sister-in-law, who lives in Oklahoma, recently got engaged and has decided to have her wedding in Las Vegas next spring. I’m incredibly excited! This means that I get to be a part of the wedding planning – which is something I’ve discovered I love to do and I’m actually quite good at. The La Capella Chapel at Chapel of the Flowers. This isn’t the first wedding in our family that’s taken place in Las Vegas. My brother-in-law, who lives in Oregon, also got married here a few years ago at a place called Chapel of the Flowers. It’s located at 1717 Las Vegas Blvd S, towards the “old strip” and downtown. I just learned, after looking at their website, that Chapel of the Flowers was selected for a new reality show on TLC (airing this fall). I’m not surprised! The employees there are extremely helpful and friendly and the grounds, although on the smallish side, have so much character! There’s an outdoor chapel and a few indoor chapels that all have different looks and themes. Some seat 20 people, some seat up to 60 people. There are web cameras in every chapel, so that even family and friends who weren’t able to make the wedding can watch it live, online. 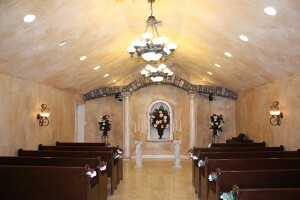 My brother-in-law was married in their The Magnolia Chapel. They also offer off-the-grounds weddings in the Nevada desert or on a private yacht at Lake Las Vegas. The place holds the true essence of a Las-Vegas-style wedding, and I’d recommend it to all my friends and family. 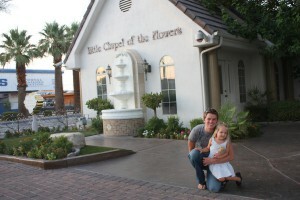 The future groom and my daughter pose in front of Chapel of the Flowers. A few weeks ago, since she was unable to come herself, my soon-to-be-married sister-in-law sent her fiance out to Vegas on a mission: to look at three different wedding locations in one afternoon. Like a lot of brides, she’s on a tight wedding budget. I was happy to drive the future groom around for her, taking pictures as we went and giving him my “female” perspective. Our first stop was a place called The Grove. Since this was a last minute trip, instead of making an appointment to view the grounds, we just showed up. Unfortunately, there was a wedding about to start (more women in white dresses!) so we weren’t able to explore as much as we would have liked. I was impressed with what I did see though! The place, at 8080 Al Carrison, is just a hop, skip and a jump from Floyd Lamb State Park on the far north side of town, and is completely surrounded in pink oleanders. My daughter and I noticed how lovely all those flowers smelled as we walked to the office. There was so much green grass around I could hardly believe my eyes (grass is hard to come by here). A gazebo was tastefully decorated at the edge of the oleanders with soft, rolling hills in front of it. One could forget they were in Las Vegas at The Grove. The trees were tall and lush (very tall trees are another luxury in Las Vegas), and the neighborhood was extremely quiet and peaceful. I could imagine lots of locals would choose this place to get married. Alexis Park Resort's outdoor gazebo at sunset. After a short visit to Chapel of the Flowers, the groom and I took a short drive to Alexis Park Resort. At first, this looked just like a ordinary hotel, but once we walked through the lobby and out the glass doors to the back, it opened up to charming, outdoor gardens and a pool with a fountain in the middle of it that made gentle water sounds. The pool was surrounded by condo-looking hotel rooms with palms trees in every corner of the grounds. We continued to follow the path past the pool and came to an elegant, white gazebo completely covered in soft, white lights. I heard the groom-to-be gasp when we first saw it (maybe this is the one?). There were candles lining the aisle, simple white chairs on each side and flower pedals all around our feet. The sun was setting and I could easily picture my sister-in-law having an evening wedding there. Even though this location had the least amount of character, it was my favorite. It had a peacefulness to it the others didn’t, and would make accommodations and transportation extremely easy for the out-of-town guests since hotel rooms and reception areas were right on the property. I went home that night and composed an online picture album of our afternoon adventure, and included my comments and details on each picture. I sent it to my sister-in-law in Oklahoma, so even though she was unable to come out herself, she could get a real-life perspective on what’s nice and what’s not. My next wedding project for her? Bakeries and catering! Having so many resources and choices for a budget wedding makes planning one exceptionally fun (especially since I’m not the bride!). I’ll never get sick of it because Las Vegas will never run out of places to get married – and it will never run out of “princesses” in beautiful, white dresses, either. Vegas is a great destination wedding place because it’s easy to get to for all of your far-flung guests. Plus you get the instant celebrity cache of being able to say you were married in Vegas! wedding sites. This has always been a fascination of mine since Vegas is the wedding capital. That sounds like a post I’ve got to read! — Lovely post and one I will be sharing with our Tweeter friends! What an exciting new job for you : ). Visiting all the chapels and ceremony venues was fun I’m sure, but I’d really be most thrilled about the sampling portion that is upcoming ; ). 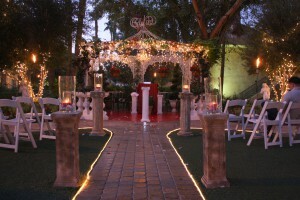 Tasha: Thanks for including the Alexis Park Resort hotel in your suggested Las Vegas wedding venues. I wish you had given us the opportunity to provide you with a personal tour as you could not have known about several of the other gems we have on our 16 acres. Our own indoor Chapel! Our Terrace, with a spectacular view of the entire Strip! Poolside at any of our 3 pools …… and many more. Perhaps in the very near future? Best Wishes. Patrick. General Manager at the Alexis Park Resort Hotel. After reading your blog it makes me understand that sometimes we don’t really appreciate what we really have. On a side note I really would really respect your ideas on the best place for my brotherto go for a honeymoon. Thoughts? After reading this post it makes me realize that sometimes we don’t really appreciate how blessed we really are. On a side note I really would really appreciate your input on the best place for my friendto go for a honeymoon. Thoughts? Feel free to send me an email at Tasha@living-las-vegas.com so we can chat more about it. I’d love to brainstorm with you! Are you interested in honeymoon locations near Las Vegas or anywhere in the world?